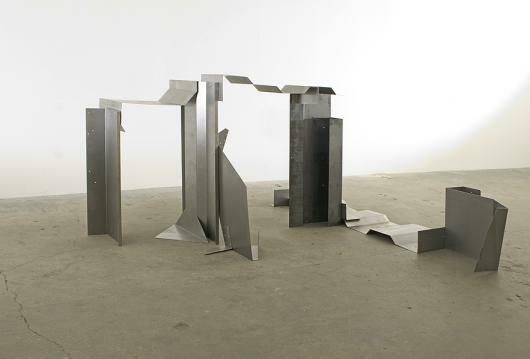 This set of abstract constructions in 2mm steel is the most recent work of the sculptor Robin Greenwood. The works presented here aim to be visual and to be literal; what you see is what you get. Whilst in one sense straightforward, art that gives this priority to the visual is anything but simple. Instead it focuses attention on the complexities of sight and its structuring, and always leads to the irreducible gaps between an artwork, our comprehension of it, and the subsequent articulation of that comprehension. Perhaps sculpture, in comparison to painting, complicates these disjunctions. With the latter, our fixed viewpoint provides similarly fixed, or at least relatively stable, points of departure for description, and so analysis. In contrast these constructions exploit their ability to extend into and occupy space, to encourage our movement around them, and to avoid or disrupt single dominant views. Doing so they further compromise linear description, inevitably forced to adopt a single starting point. Souvenir of New York forms a self-contained unit. Its steel elements, neutrally coloured and plainly textured, were impersonally cut, folded, then bolted into structure. Generally individually characterless, their value lies in integration into an interlocking framework of visual resemblances, rhymes and rapports operating through and defining space. The major elements of this structure are three unevenly-sized columns. These are arranged along a staggered axis and linked by two geometrically undulating crosspieces. Each column is constructed from individual sheets bent into near or full right-angles, or multiple sheets bolted together similarly. Their concertinaing is firstly practical but beyond this, when under the bright and consistent gallery lights, the abrupt angles resolve into clear successions of upright shafts of light and dark. This visually confirms the stability of the columns, a confirmation set off against the rising and falling light and dark horizontals of the crosspieces. Importantly, between the columns, and under the crosspieces, are two spaces – one smaller, one larger – spaces that expand into the angles the sheets create, and that are rendered clearly legible because of the legibility of tone on the columns. The control of tone, used to articulate the physical placement and relations of parts in space, and to accentuate the qualities of individual components, runs throughout this body of work. Connected to one of the end columns is a low unit that forms a right angle to their axis. Here the crisp undulations of the crosspieces are echoed, but with deadpan, almost minimalist, repetition. The dark spaces produced under the ridges read as near solids, and anchor the verticals, and open spaces, of the rest of the construction. A relief from the ridges’ weight is provided by the attachment of a single sheet of steel, bent into an approximate ‘S’ shape. As its far end moves - in contrast to other elements of the construction it has its own sense of animation - away from the rest of the unit, it twists so that the final segment lifts off the floor and turns to describe a corner - one end of the ‘S’. This corner and, importantly, the triangle of negative space that it creates as it lifts off the floor, are part of a succession of affinities that tie this extremity back into the centre of work. Instrumental in this is an irregularly shaped piece bolted flat against the central column, folded at its base to form a triangular lip and at its top to a triangular point angling away from contact with the column. The relations set up between this element and the corner of the ‘S’ claim the space that separates them as part of the work, and in doing so ensures the construction occupies more than simply what its two predominant axis define. This space is integrated into the large one, under its crosspiece, with an arc of small triangles, rhyming negative, positive, negative, positive, commencing with the gap under the ‘S’, and concluding with the protruding tip of an element bolted to the other side of the central column. Sequences such as this run through, and articulate, the work’s open spaces. This openness means these progressions are read from points around the work so that the whole expresses a particular form of three-dimensionality founded on the accumulation of sets of details, seen by the viewer, then held in relation to each other as the circumference is completed. The focal point of Camasunary Dolphin is a single sheet of metal bent, almost to the point of contortion, so that it seems caught exactly half-way between being stretched (or stretching) to its full height and being crumpled to the floor. Its folds angle into exaggerated contrasts of light and dark – a mechanical chiaroscuro. The piece supports itself on a thin base, whilst its pointed tip is bolted to one end of a trough-shaped beam. Uncertainty about the sheet’s compressive or expansive power is compounded by this connection; both elements must rely on one another for support, yet we do not feel weight transmitted between them. This un-physicality, implicit in Souvenir of New York’s corralling and articulation of space, elicits new tension here, where it is made explicit as attention shifts from gaps in between to the shapes themselves. The beam carries along most of its length an awkwardly shaped element, folded so to stiffly hang downwards on one side and stiffly flick up on the other; it is perhaps this addition that denies the beam’s weight. The far end of the beam attaches to a column, though one formed with little of the rigid verticality of those found in Souvenir of New York, with one edge cut so it slants inwards from base to top. This sequence – column, beam, contorted sheet – is one that cuts through space, an enlarged version of the relations running through Souvenir of New York. Its progression is held with two pieces physically separate from the rest of the construction. These join to form something of a corner, or the thick end of a wedge where the column is the apex. One part is bent to a splayed concertina, whilst the other, apart from a fold necessary to create the base on which it rests, is completely flat. The latter is placed a few inches distant from, and just off parallel to, the contorted sheet. The relation between the flat and the contorted sheet is the key incident in the construction. The two elements are close, yet do not touch; there is no solid thing – such as the beam linking sheet and column – explaining with consistency the area between them. Yet more than this prevents the space from taking on a definable character of its own. As the viewer assumes different positions around the work the sheets’ appearances shift dramatically, to the extent that there is difficulty imagining one viewpoint in terms of another; something that Souvenir of New York relies on to assert itself in three dimensions. From one angle the flat sheet stands behind the other, they are visibly a pair, of similar height and width and with one base rhyming against its neighbour’s and against the angle of its folds. A few steps round and the contorted sheet has lost its breadth, and is almost a silhouette of harshly contrasting acute angles against a flat, monotone expanse. This image of a silhouette against flat expanse is one that seems drawn from the vocabulary of painting and contrary to a conception of sculpture where space is used to contain the virtues of physical weight, of presence. Camasunary Dolphin exploits this tension. The shapes are highly clarified, reading almost without physicality and just as pattern, but this is always accompanied by our awareness that they do exist in space, that there is this gap between them. This spatial awareness, used in Souvenir of New York as part of a process of gathering information, of circling the work, and testing one sequence of relations against another, is, in Camasunary Dolphin used to energise a succession of views, complete, and asserting their independence from each other. Sam Cornish c. Poussin Gallery 2006.